The way people consume television in this day and age is much different than years past due to the advancement of technology and the rise of streaming services. While most households still use traditional TV services, there has been a drop in cable subscribers within the last decade. In the last few months of 2017, 79% of American households subscribed to pay TV services such as cable or satellite, compared to 88% in 2010. 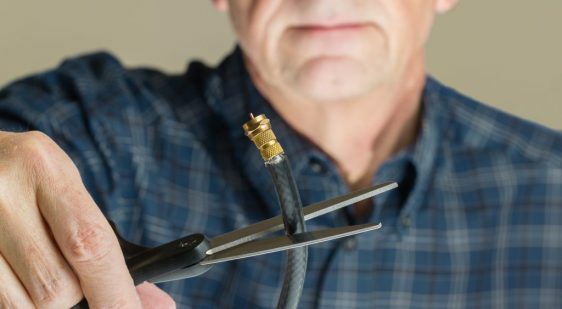 The numbers continue to decline as technology allows more people to “cut the cord” – and cord cutting is here to stay. Research group, TDG, predicts that in 2030, approximately 30 million households will be living without pay TV service. Why Cut the Cord in 2018? With nearly 200 channels available through streaming services, traditional cable is waning. In 2017, cabletv.com calculated the average price of purchasing TV service at $72.60 per month. That average comes from nine of the US’s biggest television providers, and it’s a significant amount for many households. But it’s more than just cost. Today’s viewers watch TV differently than they did just ten years ago. The proliferation of mobile devices makes it easier for us to get the entertainment we want when we want it. Why race home to watch a movie on HBO when you can stream one on Netflix or Amazon Prime Video? Why schedule time to watch your favorite network sitcom when it will soon be available commercial-free on Hulu? What’s more, the literal cords involved in home entertainment can be a headache. All the wrangling of cords and hassling with DVR programming is just not worthwhile when there are more high-tech, easier-to-use options available. HDMI connections are great, but there’s no longer any reason for a physical cord. In addition to dropping their expensive TV packages, people everywhere are actually doing away with annoying cables. Streaming internet content is here to stay, no question, but people still love to lean back in their home, curl up on the couch and enjoy content on the big screen. With the advent of Miracast, and products like the ScreenBeam Mini2, people get the best of both world – a simple way to wirelessly enjoy content on any HDMI equipped big screen display. Ready to cut the cord on your cable TV? If you’re an avid user of streaming services and tired of having your TV viewing space littered with cords and cables, it’s time you consider cord cutting. Using the right devices eliminate the hassle of needing extra cables and allow you to easily watch content anywhere. A TV with an HDMI port. You probably already have one. If not, there are tons to choose from. You can even use a computer monitor if you want to. ScreenBeam Mini2. Easily the best screen-mirroring device for cutting the cord, the ScreenBeam Mini2 is basically wireless HDMI. With a direct HDMI connection to your display, you get all of the picture and sound quality without having to search for the right cables. It’s super portable, too, so you can take your entertainment on the road. A Miracast-enabled laptop or mobile device. Miracast is native to Windows and is available on Android devices. Streaming services. Netflix, Hulu, Sling, HBO Now, YouTubeTV, DirecTV Now, and Amazon Video are great examples, and new services continue to emerge. One of the best things about cutting the cord is that you can pick and choose, subscribing to the services that suit you. You can even rely entirely on free online sources for your entertainment. With a ScreenBeam Mini2 connected to your television, your mobile device or laptop beams content directly to your TV via Miracast – no WiFi needed! It’s like connecting your device to your TV with a cable, but there’s no cable. It’s that simple. You can stream your favorite shows, show photos and videos, or play music on any TV without the need for cables or routers. Plus, you won’t have to deal with Wi-Fi-related lag and buffering. You can watch tons of movies and TV shows without the expense and hassle of a multichannel video programming distributor. Essentially you get what you want, where you want, when you want without having to sacrifice the awesomeness of your big-screen (when you want). itThat’s what cutting the cord really means. No more cable or satellite service, and no more cords getting in your way. Millions of people have cut the cord on cable. They’re tired of the shenanigans and expense of traditional television services. Their tastes are evolving, and the technology is keeping up, making cable cutting a reality. It’s a great time to cut the cord—in more ways than one.